LOS ANGELES (AP) — Students and teachers at a Los Angeles high school missed their lunch break Friday after a mountain lion strolled onto campus and tried to join them. The big cat was spotted walking across the quad at John F. Kennedy High School shortly after noon. Instead of sitting down to eat, students and teachers quickly secured themselves in classrooms and called authorities. Police sealed off the area until a game warden could arrive and knock the animal out with a couple of tranquilizer darts, said Andrew Hughan, state Department of Fish and Wildlife spokesman. When officers arrived, the mountain lion bolted into a nearby backyard but quickly grew sleepy and confused after the darts hit. 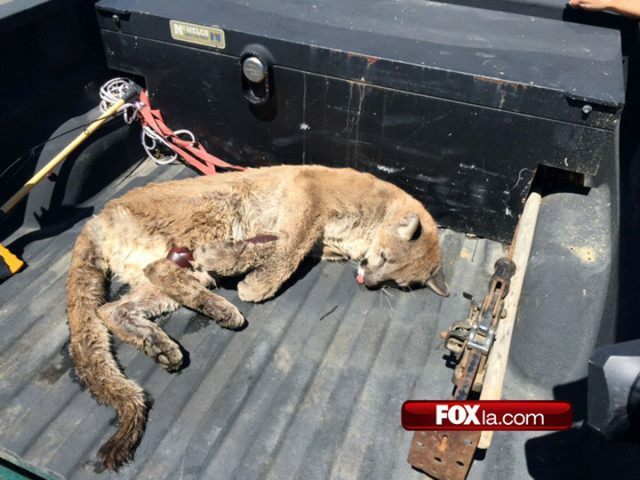 “He’s on his way back to the Santa Susana Mountains, in what we call suitable habitat,” Hughan said, adding that the animal appeared to be healthy and about 2 or 3 years old. The department later posted a video on Twitter of the “groggy” big cat returning to the wilderness. Kennedy High School is in the city’s Granada Hills section, on the edge of mountain lion country. Still, it had to journey a couple of miles through a large residential neighborhood, across a golf course and around a freeway to get there. “Probably what happened was it was chasing a deer, a rabbit or a dog late last night for food, and it looked up this morning, saw the school and thought, ‘Oh, oh, I’m in trouble now,” Hughan said. Mountain lions wander into cities somewhere in California every few weeks, he added, but this one got more attention than usual when it caused a school lockdown. “Be assured that all students and staff are safe,” school officials said in an outgoing telephone recording. A famous mountain lion known as P-22 has been wandering the Hollywood Hills near Griffith Park, a sprawling urban wilderness, for some time. P-22 was blamed for devouring a koala in the park’s Los Angeles Zoo last month, but it remains popular enough to have its own Facebook page. The animal wears a tracking collar and was famously photographed near the Hollywood sign for National Geographic.